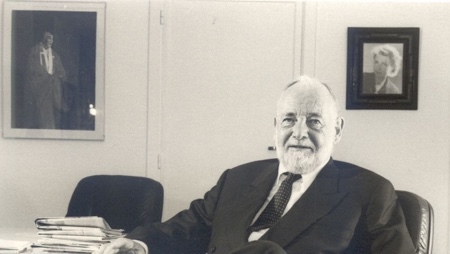 Christian-Pierre Bourg, founder of the C.P. Bourg Group, an international company specializing in print finishing equipment, has passed away at the age of 89. Mr. Bourg died Sunday, November 16, 2014 in Boston, Massachusetts, not far from the company’s US headquarters in New Bedford. Christian-Pierre Bourg started his company (C.P. Bourg S.A.) in 1960. Over the past few years, even though he no longer oversaw day-to-day company business, he nevertheless still made a point to go to his office every day. In 2013, Mr. Joël Tourneix, head of the French subsidiary since 1981, was named Managing Director and CEO of C.P. Bourg S.A. and C.P. Bourg Inc. The announcement of Mr. Bourg’s passing has deeply affected all employees and those who worked with Mr. Bourg. Christian-Pierre Bourg held a master's degree from Solvay ULB and was considered a dynamic entrepreneur and visionary in the field of Graphic Arts. He succeeded at creating a small, yet successful multi-national company. Up to 90% of the products developed and manufactured in Ottignies-LLN (Belgium) are exported around the world. Today, C.P. Bourg has a worldwide presence via a network of 150 distributors in nearly 100 countries, a US-based corporate office and several sales offices in France, Luxembourg and Germany. Products are also distributed by major names in the world of digital printing: Xerox, HP, Kodak and OCE. Today, the group has more than 350 employees. With over 80,000 clients, C.P. Bourg’s products are known for their innovation, efficiency and excellent quality. Christian-Pierre Bourg leaves behind a deep imprint on the economic history of the Brabant-Wallon region of Belgium. He will be remembered as an exceptional businessman.